My Little Slice of Bliss: Happy Valentine's Day! Hello and Happy Valentine's Day! I'd really hoped to write up this post yesterday (at the latest) and schedule it to go live much earlier today, but between having a husband home sick for two days this week and another Nor'easter winter storm that cancelled school yesterday, I didn't have much alone time to finish my top-secret Valentine's Day projects or get them photographed for a blog post. So, finally, everything is pretty much back to normal at my house, and I spent the morning putting the finishing touches on some Valentines and gifts for my family. It will be fun to surprise everyone at suppertime tonight! I know that some folks pan Valentine's Day as an overly romantic, Hallmark-fueled holiday, but I really and truly love it! It gives me an event-kind-of-something to look forward to in the otherwise dreary, cold, and frozen month of February. The pretty colors (reds! pinks! lavenders!) are such bright spots in the colorless winter landscape, and the fun shapes/motifs (hearts! cupids! doilies! arrows!) and loving sentiments are true pick-me-ups. And how can you go wrong with a holiday that is rooted largely in chocolate? I say bring it on!! 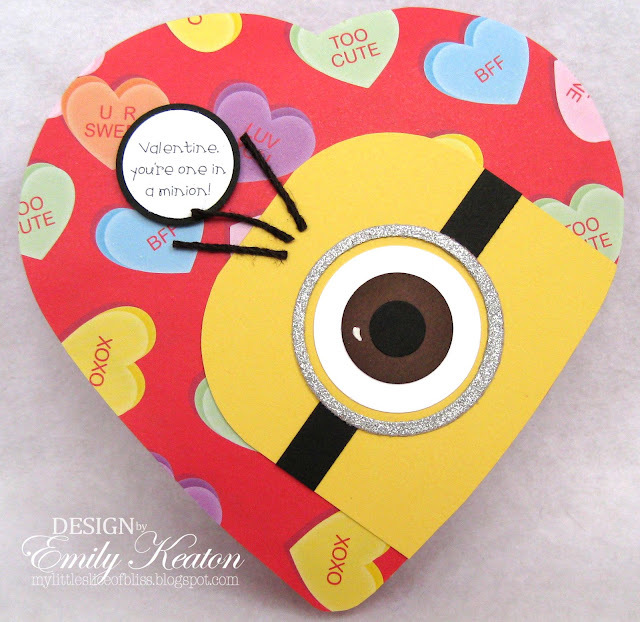 I love giving Valentines! 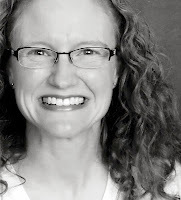 I give them to my husband and kids, but also send them to my parents, sister's family, in-laws, aunts and uncles, and friends all over the country. For me, Valentines are just such a fun way of sending a little love and letting the folks I care about know that I've been thinking of them. 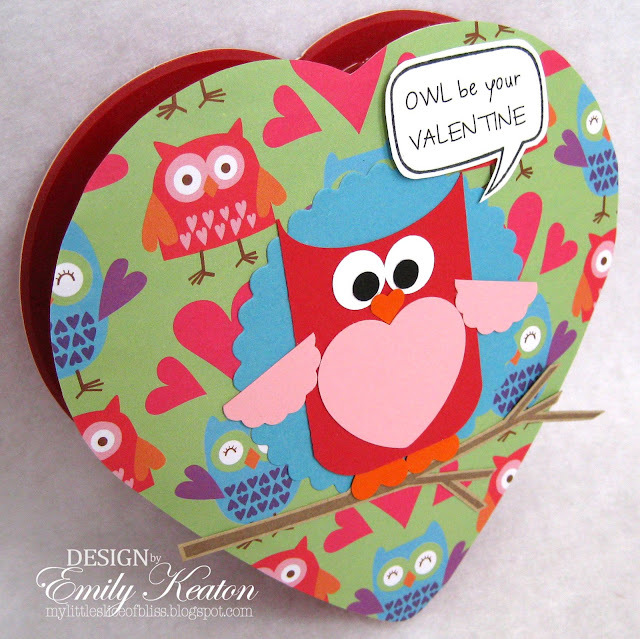 I spent a large chunk of my day on Monday getting my Valentines ready to mail: signing, stuffing and sealing envelopes, addressing, weighing and attaching proper postage, and then heading off to the post office to get them in the mail system before the end of the day. My fingers are crossed that everything will be delivered in time! Yes, it is a labor of love, but it makes me feel good, and I hope that a little something that I took the time to make and send will brighten the day of those I care about. What's inside? Some hand-dipped Dark Chocolate Vanilla Creams! I based these on this recipe from Land O Lakes. 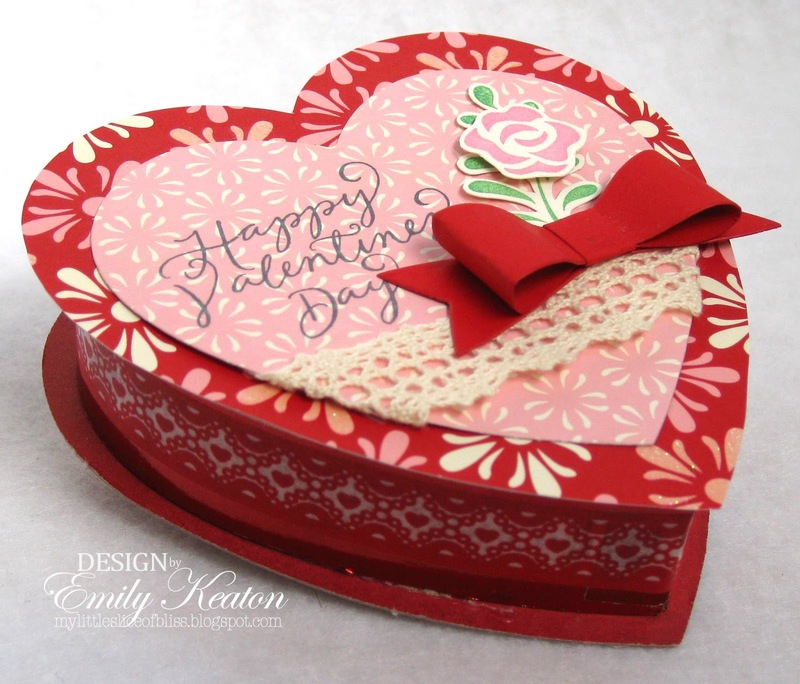 From DeNami Design: Small Valentines Script stamp, Solid Rose Accents stamp set, and Red Heart Lace washi tape. Wanna peek at what she'll be biting into? 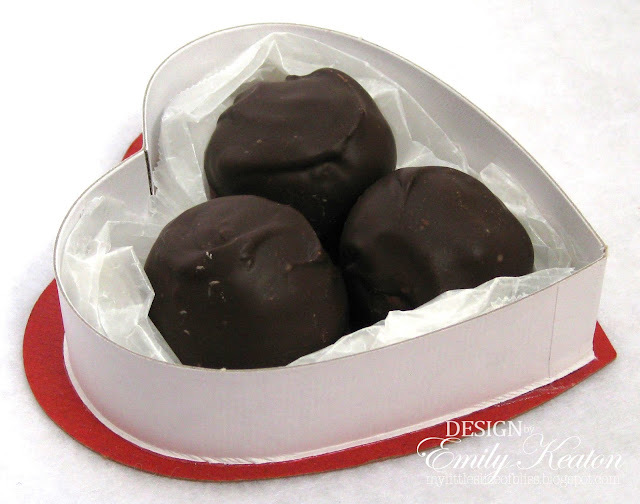 Milk Chocolate Peanut Butter Balls! I based these on this recipe from Parents Magazine (February 2011). From DeNami Design: Square Word Bubble stamp, Love Sentiments stamp set, and heart from Whimsical Valentine stamp set. The patterned paper is from Target's One Spot, and I printed the sentiment with my computer. 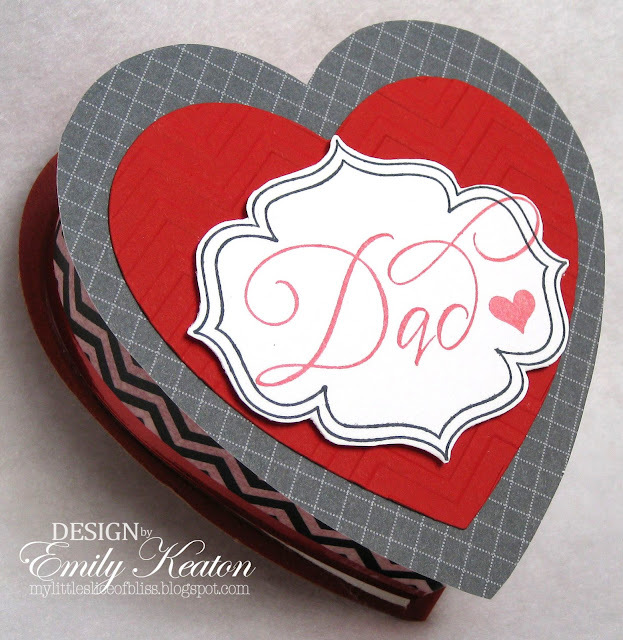 From DeNami Design: Small Valentines Script stamp, Love Sentiments stamp set, Small Heart Outline stamp, Small Scallop Heart stamp, chevron border from Modern Borders Set, and two white Boutique Buttons. I can't wait to see everyone's reactions!! Thanks for bearing with me through this long and photo-heavy post :D! I hope that you have a lovely day today. Happy Valentine's Day Emily! I love your sweet little decorated boxes and the treats inside them look sooooo yummy! What a lovely way to tell someone you love them. I am sooo excited about your little penguin and owl and the minion is adorable. I am going to have to try these cute ideas out. It's so much fun creating something from punches. These are all just wonderful Emily!! What sweet up-cycled boxes too, love how you decorated them all!! The minion is just too cute! Everyone will surely love them!! Happy Valentine's Day to you! Thoroughly impressed! These are ALL amazing, Emily! You have been busy, not only with crafts and foods but snow filled, germ filled days. Love, love, love, love (did you see my Halloween post?). 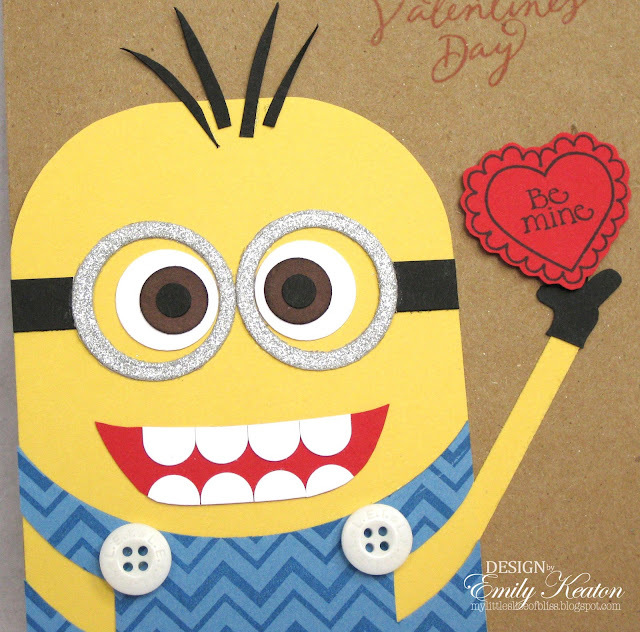 Can I commission you to make me a Minion card? This is certainly a love-infused post, Emily! I 'used to be' not much for Valentine's Day, but with the arrival of my niece nearly four years ago, and my nephew, nearly two, I've changed my tune! This year, I was ecstatic to make 51 Valentines for their daycare mates and teachers! My only wish: more time to make extra special things for them. But I will - this week - to deliver, hopefully in person, next weekend. Valentine's Day celebrated late is A-okay! Your projects here have me in awe! They're thoughtful, heartwarming and delicious! Home-made chocolates? Your creativity and talents are infinite! Happy Valentine's Day to you, Emily! How fortunate your family is to have you in their midst! You're a gem! Oh wow, you have made some gorgeous boxes of chocolate!! The minnion card is really cute!! Hi! I hope you had a wonderful Valentines Day!!! 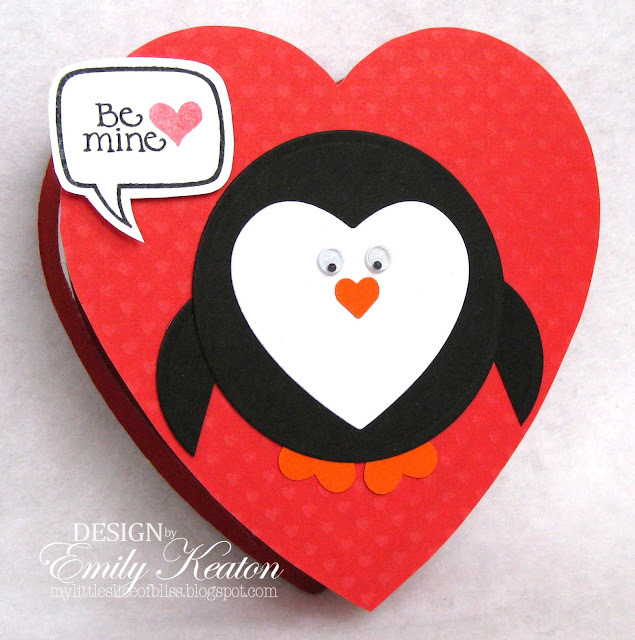 These decorated boxes are adorable!!! And that card is so CUTE!!!! Oh Emily, these are all so cute. Love how you did the boxes and the candy is making my mouth water. 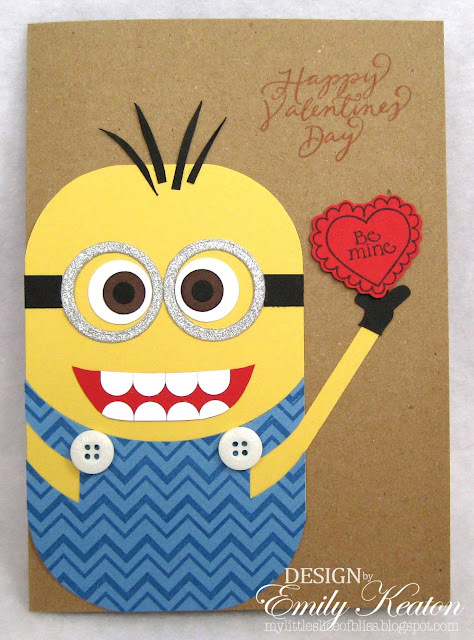 The cards are all cute and I will be CASEing the minion. My granddaughters are crazy about them. Emily, these are all AWESOME!!! Oh I bet your family was thrilled with their wonderful Valentines, Emily! 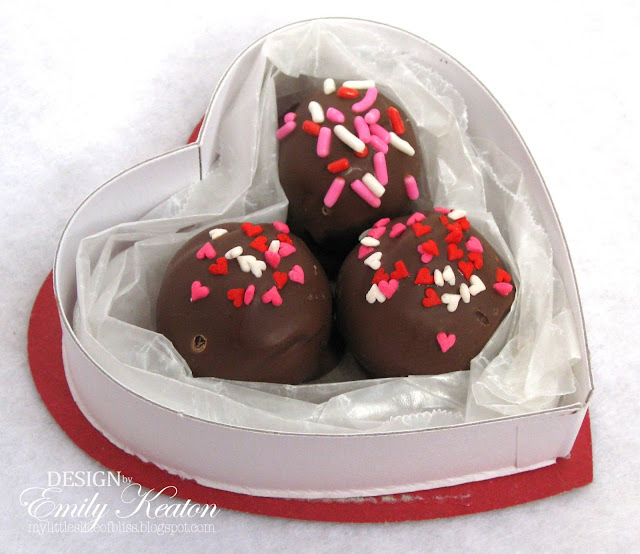 Wishing I was getting some of those homemade chocolates--LOL! So glad to know someone else who love celebrating Valentine's Day. I always sent everyone in the family cards even before I was a cardmaker. Emily, these upcycled heart-shaped boxes filled with homemade goodies are absolutely FANTASTIC!!! Those treats look SO YUMMY! And I LOVE how you personalized each box for the intended recipient!!! So thoughtful and extra special!!!! You are such a sweetheart! I bet your family loved their Valentine's Day gifts!! !